Things weren't supposed to go like this for Eugene Record. It was 1979, and the former lead singer and principal songwriter of The Chi-Lites was releasing the third album of his solo career, following his split from one of the seminal soul groups of the 70s and the signing of a lucrative recording contract with Warner Brothers. After incredible success and several #1 hits with the Chi-Lites, Record left the group amid financial problems at their label, Brunswick, and less-than-stellar performance of their final Brunswick release, Half A Love, which was already languishing in 50 cent cut-out bins around the US. The Warner contract gave Record the chance to spread his creative wings, but his first release, The Eugene Record, was surprisingly conservative, including some good songs but an overall sound that felt a bit dated, ignoring the emerging dance grooves that were bubbling up in cities like New York, Philadelphia and even his home town of Chicago. It faded as quickly as it came, as did the follow-up, Trying To Get To You, despite an appearance on Saturday Night Live and a slightly stronger set of songs. So, by 1979, Record was watching the red hot disco music market around him and, though he was best known for his ballads of lost love and was approaching age 40, he was determined to show that he could work the club as well as he did the bedroom. 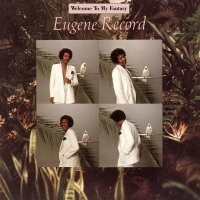 Record turned to versatile young producer Patrick Henderson (The Doobie Brothers, Carl Anderson) to help fashion an LP more in tune with the times, and the result was his best solo album, Welcome to My Fantasy, now being reissued courtesy of Expansion Records. Record made his mission clear from the first cut: "Where Are You?" is a seven minute collaboration with Gospel great Andrae Crouch that starts off slow and haunting, lugubriously counting the days of a week of loneliness, before breaking into a scorching groove, the joy of which belies the tale of a man missing his love. The upbeat grooves continue for most of the album, as "Sweet Insanity" touches on elements of P-Funk, and the title track is the near perfect blend of disco beats and classic Chi-Lites sweetness. One listen to the album's single, "Fan The Fire," and you can hear the seeds of the electronic dance style that would fuel Record's second run with the Chi-Lites and future hits like "Hot On A Thing" and "Stop What You're Doing." Record doesn't completely eschew love songs on Welcome, as he delivers two ballads, the treacly "Dreams Come In Colors" and the much nicer soulful duet, "Help Yourself to Love." The Expansion reissue also includes cuts that were recorded for Warner and which have been floating around the internet for years, but were never before on an album. The straight up disco club number "Magnetism" and the medley of "Take Everything" and "I Don't Mind" are worthy additions that make this very nice reissue even more of a must-have. Eugene Record recorded four more albums with the Chi-Lites in the 80s, before turning to Gospel music for his final solo album, Let Him In (1998), and his too-early death in 2005. But, for my money, the often overlooked Welcome To My Fantasy was the hidden gem of a brilliant career, and is now one of the most surprisingly pleasant reissues of 2015. Highly Recommended.